This book examines the government of Hong Kong since its handover to mainland China in 1997, focusing in particular on the anti-government mass protests and mobilisations in the years since 2003. It argues that Hong Kong has been poorly governed since transferring to Chinese rule, and that public frustration with governmental performance, including anti-subversion laws and slow democratisation, has resulted in the regular and massive protests, which have been rare in Hong Kong's past political development. 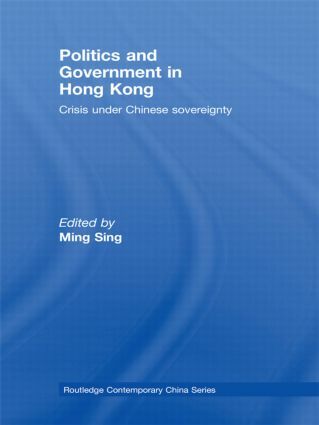 The book then assesses different explanations for Hong Kong's government problems, including lack of social cohesion, incomplete economic restructuring, structural budgetary deficit, severe social inequality, intensifying cronyism and deficiencies within the political system itself. It goes on to discuss the implications of poor governance for legislative elections, civil society and constitutional development, and considers the prospects for the future. It argues that although in the short-term the Hong Kong government has managed to maintain its popular support ratings, in the longer run it is unlikely to be able to maintain its legitimacy in dealing with the fundamental challenges of government unless the current system is replaced by popular election of the government with appropriate institutional capacity and political powers.